Repetitive transcranial magnetic stimulation (rTMS) is a well known non-invasive brain stimulation procedure which is capable of inducing the expression of the hippocampal BDNF that has been already shown to exert significant neuroprotective and pro-cognitive effects in AD. However, it is nearly impossible directly to evaluate the BDNF expression in humans after rTMS application. Here we summarized the underlying mechanisms of the neuroprotective and procognitive effect of BDNF that can be induced through a region-specific rTMS approach. Additionally, we have also evaluated the role of Magnetic Resonance Spectroscopy in monitoring the BDNF response after rTMS application in Alzheimer’s Disease. We have provided strong evidence that rTMS exerts significant neuroprotective and pro-cognitive effects through the expression of hippocampal BDNF. Furthermore, Magnetic Resonance Spectroscopy might play a critical role in monitoring the BDNF response after rTMS application in AD patients. Such a sophisticated approach might be able to enlighten us on the time-dependent cognitive and neuroprotective correlates of the rtMS application in AD patients. 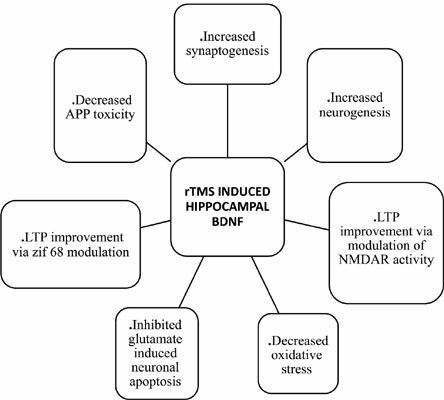 Keywords: rTMS, BDNF, MRS, hippocampus, neuroprotective, AD patients. Keywords:rTMS, BDNF, MRS, hippocampus, neuroprotective, AD patients. Abstract:Repetitive transcranial magnetic stimulation (rTMS) is a well known non-invasive brain stimulation procedure which is capable of inducing the expression of the hippocampal BDNF that has been already shown to exert significant neuroprotective and pro-cognitive effects in AD. However, it is nearly impossible directly to evaluate the BDNF expression in humans after rTMS application. Here we summarized the underlying mechanisms of the neuroprotective and procognitive effect of BDNF that can be induced through a region-specific rTMS approach. Additionally, we have also evaluated the role of Magnetic Resonance Spectroscopy in monitoring the BDNF response after rTMS application in Alzheimer’s Disease. We have provided strong evidence that rTMS exerts significant neuroprotective and pro-cognitive effects through the expression of hippocampal BDNF. Furthermore, Magnetic Resonance Spectroscopy might play a critical role in monitoring the BDNF response after rTMS application in AD patients. Such a sophisticated approach might be able to enlighten us on the time-dependent cognitive and neuroprotective correlates of the rtMS application in AD patients. Neurogenesis in Alzheimers Disease: A Realistic Alternative to Neuronal Degeneration?